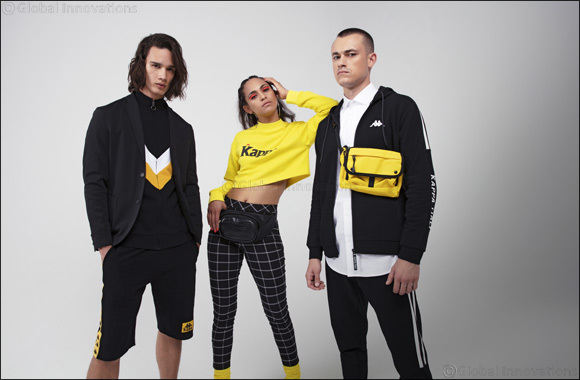 Kappa is taking new steps by adding more flavor and excitement into the new collection. This season the vintage and classic sportswear is expanding, more fun and vibrant. The ‘bling' women's collection especially speaks volumes about the newness with a lot of gold and silver sequins play, studs and oversize branding. It shows that how Kappa is loving its current popularity and is truly “shining” in all its glory. The shapes remain sporty with a mix of hoodies, joggers and oversize tees but the graphic language is the head turner. The menswear isn't far behind when it comes to the freshness with a collection dedicated to celebrating the authenticity of the brand. The iconic ‘banda' tape is used in various ways and “Like no other” slogan is also added. The colors are kept strong with just reds, blacks and white and shapes are restricted to t-shirts, shorts and track sets. The final menswear collection makes its mark with a cool street chic vibe and a very fresh mustard shade. The story also celebrates the ‘banda tape' but the shapes are slightly more oversized to maintain its theme. The shapes consist of oversize tees, sweatshirts, shorts and a fabulous tracksuit which was also showcased in the recent Splash® Fashion Show.